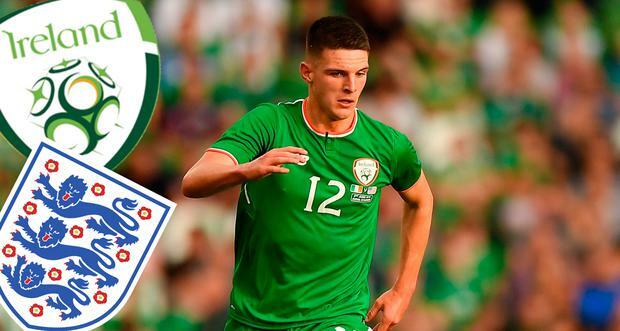 Mick McCarthy says he’s heartened by news from the Declan Rice (right) camp that the West Ham player still has an open mind on his international future and is eager to speak to the new Ireland boss. McCarthy has had a busy few days since he was appointed Ireland manager last week, with scouting duties in the Championship last week and the draw, in Dublin yesterday, for the Euro 2020 qualifiers. He says he plans to travel around England in the weeks ahead to speak to current squad members as well as watching them play, but the recruitment of Rice back to the fold is vital. Rice, impressive again for West Ham in their win over Newcastle at the weekend, said he is keen to follow up on McCarthy’s conversation with Rice’s father by agreeing to a face-to-face meeting. “Mick has spoken to my dad and he wants to meet me and my dad, which I said was fine,” Rice said. “I haven’t spoken to Mick myself yet, but my dad has. McCarthy said that was encouraging news. “I told you (media) at the press conference that I was going to meet him and that’s just what I’ll do. I’m delighted that’s what he wants to do because if he said yesterday that he didn’t want to meet, it would have been a problem,” McCarthy said. England boss Gareth Southgate said he wanted to give Rice the space to make his own decision. The pair have not met since their meeting at St George's Park in June. "I think that subject has been discussed and there is no update on that," he said. "He is a very good player. "At the moment I have certainly allowed him time to make a decision and I think that's important for him to have that space." McCarthy is still mulling over his backroom staff, hoping to bring in a goalkeeping coach while he could make other changes, having stated his desire to overhaul the scouting network. And scouting has been done. McCarthy went to see Brentford v Sheffield United and Millwall v Birmingham City last week; his assistant Terry Connor took in the midweek 5-5 draw between Aston Villa and Nottingham Forest and the weekend clash of Birmingham and Preston, while McCarthy had a scout at the Reading-Stoke City game. Scoring goals, or creating chances, has been the big problem for Ireland in 2018 and McCarthy could try a few things to rectify that. He did not rule out a recall, after a 13-month exile, for Aiden McGeady. And David McGoldrick, who played (and played well) under McCarthy at Ipswich could also come in from the cold, having been frozen out by Martin O’Neill.